On December 7th 1941, on an otherwise peaceful Sunday morning on a beautiful Hawaiian island, the first wave of Japanese airplanes left 6 aircraft carriers and struck Pearl Harbor a few minutes before 8 AM local time. In two waves of terror lasting two long hours, they killed or wounded over 3,500 Americans and sank or badly damaged 18 ships – including all 8 battleships of the Pacific Fleet – and over 350 destroyed or damaged aircraft. At least 1,177 lives were lost when the Battleship U.S.S. Arizona exploded and subsequently sank. However, they did not sink any of US Pacific aircraft carriers and they left most of the fuel needed to win the war in the Pacific. In one stroke, the Japanese navy scored a brilliant success—and assured their ultimate defeat. As I type this it is December 6th, around 10pm. I want to sleep but it eludes me. I am not yet ready for slumber. I have one more tale to tell before I close my eyes for the night – one more bit of laundry for the digital clothes line to hang out in the night air before I dream of happier pastures. Tomorrow (today, as you read this) marks the 71st anniversary of the Japanese attack on Pearl Harbor. Seventy-one winters have come and gone. Seventy-one summers have flourished and died. An untold number of men and women who witnessed the carnage of that Sunday morning have taken the horror of the day with them as they breathed their last throughout the ensuing expanse of time. The story, however, does not end with those who were there, nor with those others who went to war because of the attack. The two hour assault on the U.S. base at Pearl continues to impact America. It has reached out with its smokey fingers and touched my family. My wife’s mother is engaged to a sailor serving in Hawaii. He was a ‘local boy’; a good kid who wanted no more than to serve his country, save money for a home, and start a family. They were to be married in the spring of 1943. My wife and I do not know the name of her Mother’s fiance, all we know is that he worked in the engine room of the USS Arizona in 1941. He remains at his post with so many other of his brothers in arms. He will be interred within the ship until it ultimately collapses under the combined assaults of time, corrosion, and ocean currents. With the attack of December 7th at Pearl Harbor, the Japanese re-wrote the timeline of history for the World and, most assuredly, myself. My wife’s Mom mourned the loss of her fiance but, as with most wounds, time worked its magic filling in the piece of her which was torn away by the unnatural disaster which was Pearl Harbor. She became engaged to another local boy and was married several years later. Together they had two children – one of whom is my wife. You see, if Pearl Harbor hadn’t happened, I may have never met the woman I call have called ‘wife’ for the past 27 years. Would her Mother have had children if the sailor not been lost aboard the USS Arizona? Would they have met me? Would I have asked their daughter to marry me? I don’t know. Some things are best not considered too long lest you find yourself trapped in a Star Trek ‘Time Paradox’ episode. Suffice to say that events of seventy years ago have, and continue, to shape my family today. Ten years ago my wife and I had the opportunity to visit Pearl Harbor as part of a company-sponsored recognition event. For our five-day stay in Hawaii, we had time on our own to explore the island. On the third day we found our way to Pearl Harbor. I didn’t know what to expect. I heard from others that it was both a beautiful ‘and a horrible’ place. Some people told me that they found peace there while others had difficulty sleeping for several nights following their visit to the site. It could have been the amount of food our employer was feeding us which kept them tossing at night, but I know what it was – it was a profound sense of ‘debt’. A debt which I, and I suspect those others, came away knowing that we can never repay. I won’t burden you with the ride to the Arizona Memorial or the stark silence of the place – somethings you need to experience for yourself to understand. All I can tell you is that somewhere on the bronze plaque above the USS Arizona is the name of a man, who but for a series of horrific events, could have been my wife’s father, or, perhaps… may not have been any one’s father. One change in the ripple of time changes events forever as it expands and travels outward. Heraclitus (c.535 BC – 475 BC) said, “Nothing endures but change.” Several thousand years later, I’m thinking that this long-gone Greek Philosopher summed up things pretty well. Changes brought about by this surprise attack our Nation has touched, and has changed the paths of millions of people in the seventy years since. My family’s story is but one of them. I’ll sign off now. The clock tells me that I am due to sleep and work awaits when the winter sun rises again in the morning. 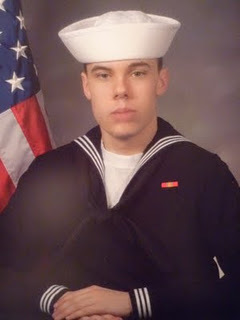 Continuing the ripple begun at Pearl Harbor continuing through Paterson, NJ, Jacksonville, Florida and most recently Central New York, I again think of my son, our boy, our ‘local kid’, Jon Kane, who is far from New York serving in the U.S. Navy. 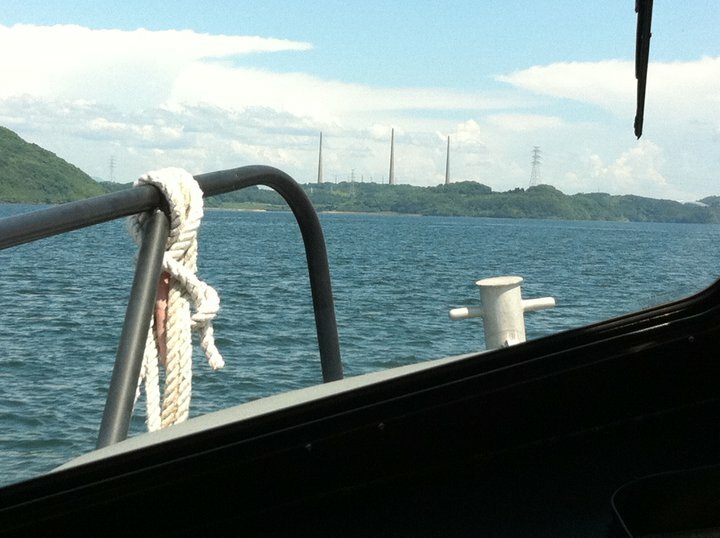 He sent a photo home from his Harbor Patrol Boat earlier this year. The three radio towers in the distance are the ones which the Japanese Military used to transmit the orders to attack U.S. Military forces at Pearl Harbor on December 7th, 1941. Seventy years later, my son patrols the harbor of the US Navy Base protecting his brothers in arms while keeping the people of Japan near the base free from harm from all threats, Foreign and Domestic.